Best Commercial vacuum are designed to be used (and abused) on a daily basis and to clean large areas regularly. Ease of use, easy dirt disposal, good air filtration, and minimum maintenance among others are significant features of commercial vacuum cleaners that are also worth considering. Having in mind different cleaning requirements, different personal preferences and various vacuums on the market, it is rather hard to make the ‘Top 10’ list of such vacuums. Here is our selection of the best commercial vacuums today. As always, you can agree with us or not. There are many commercial vacuums on the market, often with very similar features and specifications, that in the end, these lists depend only on the user’s personal preferences. – cheap disposable large capacity hypoallergenic vacuum bags with antimicrobial agent, high-speed roller brush, low profile design, side edges brushes, non-marring bumpers, 12″ cleaning path etc. Note: Amazon affiliate links open in the new windows – feel free to check the most up-to-date prices. 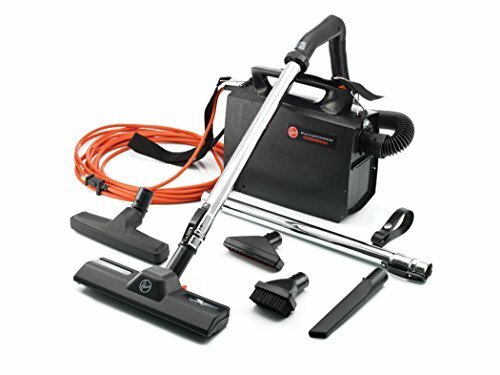 What is the best commercial vacuum? As previously mentioned, there are so many vacuum cleaners on the market, making it even more difficult to pick just one among them. There are so many aspects to take into consideration, so we would like to present our top 10 picks instead and provide you with a brief review of each machine. Check them out below. Oreck Commercial XL2100RHS is an upright, bagged, corded vacuum cleaner, designed for commercial use. It comes with a 12″ wide cleaning paths and an automatic cleaning head height adjustment system, which helps the vacuum with the transition from hard floors to carpets and back. The power cord is 35 feet (~10.7 m) long and enables the unit to clean a large area without the need to change the power outlet. Oreck Commercial XL2100RHS is optimized for hard floors and low- and medium-pile carpets, while it is not so good on high-pile carpets. It will clean them too, but it requires an extra push/pull force on such surfaces. Dirt and debris are collected in cheap disposable large capacity hypoallergenic vacuum bags with an antimicrobial agent added. This way the growth of fungi and bacteria is minimal when the dirtbag is used for a more extended period. However, it is recommended to change the bag after some time, even if the bag is not full. Other essential features include high-speed roller brush which helps with cleaning carpets and rugs, low profile cleaning head design which help with cleaning under sofas, beds, and furniture. Side edges brush help with cleaning along the edges of walls and baseboards, while non-marring bumpers protect walls and furniture for any accidental damage caused by hitting them with the vacuum. Oreck Commercial XL2100RHS is an excellent commercial vacuum cleaner for keeping large areas of floors clean. It is not suitable for cleaning an elevated surface since it has no flexible hose with additional cleaning tools. But, for everyday cleaning of large floors, one of the best buy units. For more reviews and recommendations, check Oreck Commercial XL2100RHS Upright Vacuum Amazon link (link opens in the new window). Sanitaire SC679J Commercial is an upright, bagged, corded, commercial vacuum cleaner. It is powered with 5 Amp motor, which provides 120 CFM, at 78 dB. Commercial vacuums often have ‘weaker’ motors than residential vacuums, but since their designs are optimized for performances, they don’t lack suction. On the contrary. Note that this vacuum creates 78 dB of noise – it is nothing horrible, but it could be less noisy. Unit comes with 30 feet (~9.15 m) long power cord. Such a long power cord helps the unit clean a large area without changing the wall socket, but it could be longer. Like most commercial units, Sanitaire SC679J Commercial also lacks automatic power cord rewind system – this helps simplify the design, which is more robust with fewer subsystems that could go wrong. The unit has 12″ wide cleaning path with manual cleaning head height selector and motorized brush bar. Automatic head height adjustment system would be nice to have. Vacuum bag capacity is 18 dry quarts (4.5 gallons) – and that is a lot of dirt! Also, the unit comes with a furniture guard bumper which prevents scratches on walls and furniture. Sanitaire SC679J Commercial is designed and optimized for cleaning flat surfaces. It has no flexible hose or any other cleaning attachment for cleaning elevated surface. But, it does an excellent job on various floors, which has to be vacuumed on a daily basis (or even more often). For more reviews and recommendations, check Sanitaire SC679J Commercial Shake Out Bag Upright Vacuum Cleaner Amazon link (link opens in the new window). Hoover Commercial C2401 Shoulder/Backpack Vacuum Cleaner is a bagless, corded, shoulder/backpack commercial vacuum cleaner. Since the user carries it, it has great mobility and maneuverability when cleaning various surfaces, from the floor to the ceiling. The power cord is 48 feet (~14.7 m) long, and it allows the unit to clean a really large area using a single wall power socket. Hoover Commercial C2401 has excellent true HEPA air filtration, which makes it suitable for cleaning areas often used by people having issues with asthma and allergies. The unit comes with 60″ (~1.52 m) flexible hose, 38″ (~96.5 cm) two-piece metal wands, and with additional cleaning tools: 6″ crevice tool, 11″ turbo floor tool, 2″ dusting brush, 4″ upholstery tool. 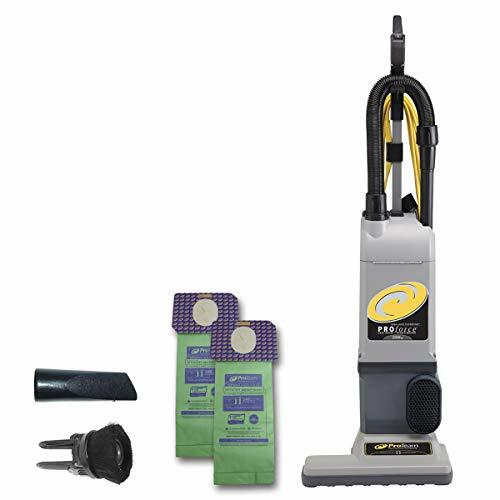 This bagless vacuum cleaner also features a flexible hose, two-piece wand, and additional cleaning tools help with cleaning various surfaces, not just floors: stairs, furniture, upholstery, bookshelves, ceiling fans, etc. For more reviews and recommendations, check Hoover Commercial C2401 Shoulder/Backpack Vacuum Cleaner Amazon link (link opens in the new window)..
Oreck Commercial BB900DGR is bagged corded, compact, commercial canister vacuum cleaner. It is designed for commercial use on construction sites, workshops, hotels, and similar areas where small and compact, but a strong vacuum is required. Its power cord is 30 feet long, and the unit weighs only 5 (~2.27 kg) pounds. It can be carried with one hand, or it can be carried using shoulder straps – for example, on ladders. Oreck BB900DGR is a very compact unit, measuring only 8 x 6 x 15 inches. Suction is provided with 4 Amp two-stage bypass motor, which creates plenty of suction. To clean surfaces from floor to the ceiling, the unit comes with 4 feet (~1.22 m) flexible hose, adjustable wand, and a number of other cleaning tools, including a dusting brush, crevice tool, floor cleaning head, etc. Oreck BB900DGR uses a disposable bag and mechanical air filter. Dirtbag capacity is modest 1 quart (~0.94 liters) – which is not surprising, having in mind how small this unit is. For more reviews and recommendations, check Oreck Commercial BB900DGR XL Pro 5 Super Compact Canister Vacuum Amazon link (link opens in the new window)..
ProTeam Backpack Vacuum is a bagged, corded, commercial backpack vacuum cleaner. It comes with an extra long power cord – 50 feet (~15.3 m) power cord helps the unit to cover a rather large area using a single power outlet. Depending on the version, the unit comes with a flexible hose and rigid telescopic or two-piece wand, plus a large number of cleaning accessories for various surfaces like hard floors, carpets, stairs, upholstery, etc. The unit can vacuum almost anything from floor to the ceiling. Although it has powerful suction, it is nonetheless, very quiet vacuum. Noise levels during operation are only around 66 dB, making it suitable for hotels, office buildings and similar areas where floors and other surfaces have to be cleaned often, quickly, without disturbing the people. The unit has good multi-layered air filtration, with ‘HEPA media filter,’ but it is not true HEPA air filtration – unit captures 99.9% of 1-micron particles, while true HEPA vacuums capture 99.97% of 0.3-micron particles. For more reviews and recommendations, check ProTeam Backpack Vacuums Amazon link (link opens in the new window)..
Hoover CH30000 PortaPower Lightweight Commercial Canister Vacuum Cleaner is a bagged, corded, compact, commercial canister vacuum cleaner. Hoover CH30000 weighs 8.3 pounds (3.76 kg) and can be used while carried by the handle or preferably using shoulder straps. The unit can be used for detailed cleaning on construction sites, workshops, but also in hotels, office buildings and similar areas where tight places are commonly found. It can also be used for cleaning large flat surfaces. Hoover CH30000 PortaPower is powered via 33 feet (~10m) long power cord, and it comes with flexible stretch hose, two-piece metal wand for extra reach, and the number of other additional cleaning attachments. To collect the dirt or debris, the unit uses reusable cloth or disposable paper bags. Note that it also doubles as the vacuum cleaner and the blower, adding to its versatility. For more reviews and recommendations, check Hoover CH30000 PortaPower Lightweight Commercial Canister Vacuum Amazon link (link opens in the new window). ProTeam ProForce 1500XP Bagged Upright Vacuum Cleaner is a bagged, upright, corded commercial vacuum cleaner. It is a strong, sturdy and powerful unit. Unit comes with two motors – one suction motor and one brush roller motor, both requiring a total of around 10 Amps of power. The unit is powered with 50 feet (~15.3 m) extra long power cord – such power cord helps the unit clean a large area using a single wall power socket. 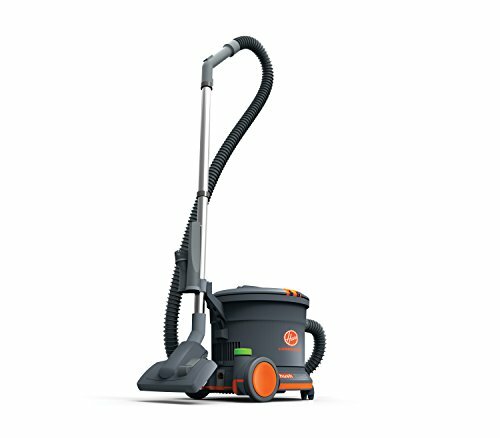 ProTeam ProForce 1500XP comes with 15″ (~38 cm) wide cleaning head – cleaning head is not symmetrical toward the vacuum’s body, and it looks a little bit awkward. But, such a wide cleaning head can clean a rather large area quickly – excellent for large flat surfaces. 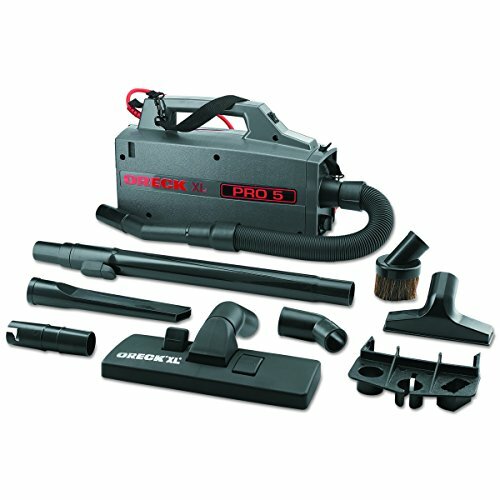 One must note that ProTeam ProForce 1500XP comes with onboard flexible 5 feet hose, cleaning wand, combo upholstery/dust brush, and crevice tool, enabling the cleaning from the floor to the ceiling. And it is true HEPA vacuum cleaner. All these features do come with a price, but this is a commercial vacuum cleaner, designed for everyday cleaning of large areas. For more reviews and recommendations, check ProTeam ProForce 1500XP Bagged Upright Vacuum Cleaner Amazon link (link opens in the new window). Hoover Commercial WindTunnel 13″ Bagged Upright Vacuum C1703900 is a bagged, upright, corded commercial vacuum cleaner. As its name implies, it has 13″ (~33 cm) wide cleaning head. Such width ensures cleaning of a large area quickly, which is very important in commercial applications. Cleaning head has manual height adjustment with five positions and side edge brushes. Different heights are essential for proper cleaning on various surfaces like hard floors, low-, medium- and high-pile carpets and rugs, but automatic height adjustment would help with traversing different floor types. Side edge brushes help clean along the walls and baseboards, leaving no floor surface uncleaned. Hoover C1703900 (or C1703-900, depending on the source) comes with flexible hose, two extension wands, crevice tool, and dusting/upholstery brush – these cleaning tools enable the user to clean various elevated surfaces, including stairs, furniture, upholstery, tight and narrow areas, etc. To protect the walls and furniture, cleaning head comes with non-marking furniture guard. The unit is powered via 35 feet (~10.7 m) long power cord, providing long cleaning reach, especially when combined with flexible hose and two extension wands. 12 Amps motor provides plenty of suction. Air filtration is excellent, with HEPA air filtration available. Like most similar commercial vacuums, Hoover C1703900 uses disposable vacuum bags. 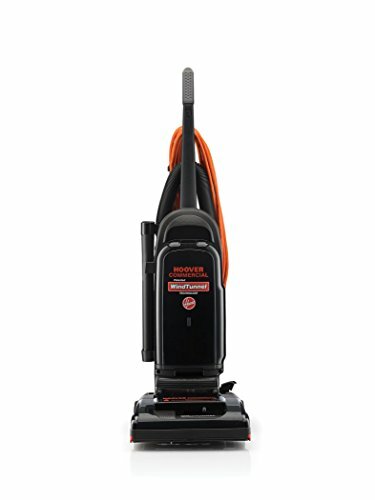 For more reviews and recommendations, check Hoover Commercial WindTunnel 13″ Bagged Upright Vacuum C1703900 Amazon link (link opens in the new window). Sanitaire SC3683B Commercial Canister Vacuum is a bagged, corded, compact, commercial canister vacuum cleaner suitable for both commercial and residential use. 20 feet power cord doesn’t allow the user to clean a large area from a single power outlet, but this unit is designed more for cleaning ‘spots’ than large areas. 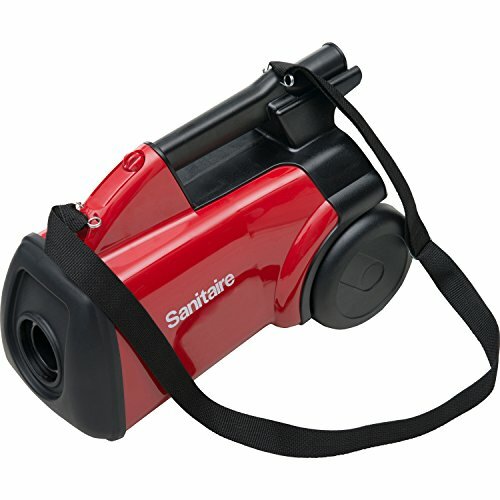 Sanitaire SC3683B main cleaning tool has a 10″ wide cleaning path. Also, the unit comes with 7 feet flexible hose, lightweight two-piece plastic wand, floor and wall brush, dusting brush, and crevice tool – enough cleaning tools to clean hard to reach and elevated surfaces like stairs, upholstery, furniture, cars, boats, etc. The unit weighs 10 pounds (~4.53 kg) and uses disposable dirtbags. The use of premium allergen filtration disposable dust bags is highly recommended. The unit has good air filtration, with true HEPA air filtration possible with optional HEPA air filter. For more reviews and recommendations, check Sanitaire SC3683B Commercial Canister Vacuum Amazon link (link opens in the new window). Hoover Commercial CH32008 Hush Tone Canister Vacuum is a bagged, corded, commercial canister/drum vacuum cleaner. Unit comes with 50 feet (~15.3 m) extra long power cord which enables the user to clean a vast area using a single power outlet. When the length of power cord is combined with flexible cleaning hose and metal wand, unit’s reach is even longer. To help with cleaning elevated surfaces, Hoover CH32008 comes with a crevice tool and dust/upholstery brush. Although Hoover Commercial CH32008 is powered with 10 Amps motor, it has a very quiet operation, creating only 62 dB of noise, making it one of the quietest commercial vacuums in its class. Hoover CH32008 dirt capacity is 9.5 quarts (2.375 gallons), and that is plenty of dirt. Of course, there are commercial vacuums with larger capacities, but it takes time and area to collect that amount of dirt or debris. The unit is designed as an upright/drum vacuum cleaner and although most user associate drum vacuums with wet and moist dirt, this is dry dirt only vacuum, not suitable for wet dirt or liquids. Hoover CH32008 is true HEPA vacuum cleaner with excellent air filtration. For more reviews and recommendations, check Hoover Commercial CH32008 Hush Tone Canister Vacuum Amazon link (link opens in the new window). Most commercial vacuums are upright vacuums, backpack vacuums, and compact canister vacuums. Upright vacuums are easy to maneuver and able to clean a large area quickly, without the need to pull canister or something similar along the way. Uprights are often designed as very simple units without extra cleaning attachments – such units are optimized for cleaning large flat surfaces, using strong suction and rotating brush bars in combination with adjustable (automatic or manual) cleaning head height. Uprights with additional flexible cleaning hose are more complicated units, they cost more, but are capable of cleaning all surfaces from the floor to the ceiling. Backpack vacuums are carried on the back or the shoulder and can traverse uneven floors easily. The main cleaning head is often connected on the telescopic wand and flexible hose. They are great for areas where maneuverability and cleaning of large, irregular surfaces are very important. 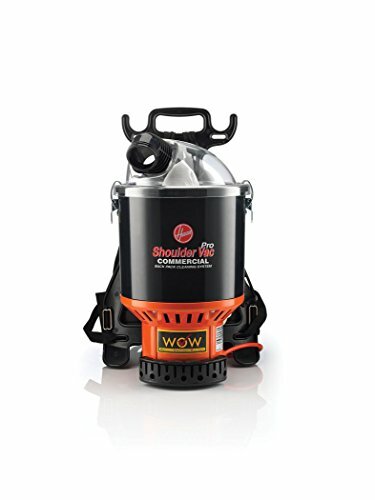 Unlike backpack vacuum cleaners, commercial canister vacuums are usually very compact units and are carried by the handle or using a shoulder strap. In most situations, they are used for spot cleaning but also can be used for cleaning larger, flat surfaces. Some vacuum cleaners are called wet/dry vacuums. Most people would regard this type of machine as a must-have particularly for those who are in the cleaning services industry. Wet/dry vacuums are very flexible when it comes to their cleaning performance. 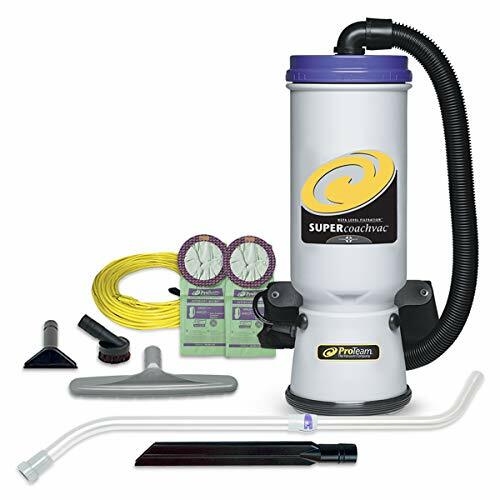 Whether you’re dealing with debris, dust, liquid spills, and whatnot, this type of vacuum can handle them all. Cord: Not all vacuums are made equally. Some have cords while others don’t. If you prefer those models with cords, make sure to take into consideration the cord length of your vacuum. A cordless vacuum, on the other hand, is more useful in areas with limited to no access to power outlets. Floor Types: Commercial vacuums must be able to clean most of the floor types commonly found in hotels, restaurants, hospitals, workshops and other areas where floors are often walked over by people from outside bringing in plenty of different dirt and debris. Such floors commonly include hard floors, low- and medium pile carpets and occasionally hardwood floors, high pile carpets, and rugs. Thus, commercial vacuums come with cleaning heads with adjustable cleaning height and rotating brushes. Rotating brushes agitate the dirt, while strong suction (ensured by a strong suction motor and proper cleaning head height) carries the dirt into the vacuum. Suction Power: commercial vacuums are equipped with electric motors that can differ significantly in strength. Commonly, motors between 4 and 12 Amps are used to create suction that removes the dirt off the floors. Although 4 Amps doesn’t sound much, these motors and vacuums are designed to be simple, but also as efficient as possible, with minimum energy losses during operation. This is very important for good suction, but also for lowering electric bills since these units often operate for hours every single working day. Note vacuum’s ability to clean depends on many other things, not just the motor strength in Amps! Air Filtration: The HEPA in the term HEPA Filtration stands for High-Efficiency Particulate Air or High-Efficiency Particulate Arrestance. Hence, a HEPA filter is considered as a highly efficient filter that can remove an impressive amount of microscopic particles. The use of HEPA filter in several vacuum models makes them a lot more preferable by most consumers. Commercial or residential vacuums with true HEPA air filtration are great. They remove at least 99.97% of 0.3 microns or larger particles from the vacuumed air. However, when cleaning heavily soiled floors on a daily basis, it is more important to clean them quickly and efficiently than to remove at least 99.97% of 0.3 microns or larger particles. Walkways in hotels, restaurants, office building, even hospitals, and similar objects get dirty quick, and it is not so important to clean even the smallest particles, but it is important to clean most of the dirt quickly – there is very little difference between 99.9 and 99.97%! Note that vacuums with a HEPA filter tend to be more pricey. If you can fit a true HEPA vacuum model within your budget, that is great. But, keep in mind that when vacuuming busy areas, there is very little difference between true HEPA vacuums and those vacuums that are not HEPA vacuums but have an excellent dirt-air filtration. Note that HEPA vacuum filters and bags create larger pressure drops and require stronger motors and in the end, increase electric bills! However, in certain situations, a vacuum with HEPA filtration can be a really good investment. Dirt Disposal: most commercial vacuums rely on disposable vacuum bags. Such bags are top filled and are designed not to decrease suction power until they are almost full. Dirt bags are changed quickly and easily, and often come with automatic seal systems – such systems prevent the dirt from exiting dirtbags when being changed. Noise: During operation, all vacuums create some noise. For both residential and commercial vacuums, low noise levels are essential in order not to disturb household members, occupants, and guest. Noise levels are usually between 60 and 80 dB, with models above 80 dB being, IMHO, too loud, except perhaps in the industry and loud workshops – even then, be sure to wear some hearing protection. For example, a quiet office is around 50-60 dB. A typical conversation goes up to 65 dB. Average city traffic is about 80 dB. Food blenders are around 85 dB, chainsaw around 110 dB, a jet taking off around 130 dB, etc. Anything below 70 dB is great and below 80 dB acceptable. Price: depending on the design, most common commercial vacuums cost less than $200, especially simplified upright vacuums, specialized for cleaning large flat surfaces. Price of other vacuums depend on their features and specifications and can go up to or even more than $400. Since they are intended for commercial use, and for everyday cleaning of large areas, such prices are, IMHO, acceptable. Warranty Conditions: most commercial vacuums come with limited terms and conditions. This includes a different warranty period for different vacuum parts (motors, cleaning attachments, other electric parts, etc.) and labor required for repairing the unit. Generally, cheaper models come with a 1-year warranty, while more expensive models come with 3-year warranties. Vacuums, in general, make a great addition to any home or commercial establishment that requires constant cleaning. If you need a good commercial unit, think what kind of unit you need, and choose according to your personal preferences, needs and of course, budget.